UNPO: Somaliland: Top Local Researchers Give Comprehensive Catalogue Covering Recognition and Statehood to MFA. Somaliland: Top Local Researchers Give Comprehensive Catalogue Covering Recognition and Statehood to MFA. Top local researchers, including a political analyst, an International Relations researcher and a civil society member, have handed over a compilation of documents covering the topics of recognition and statehood for Somaliland. 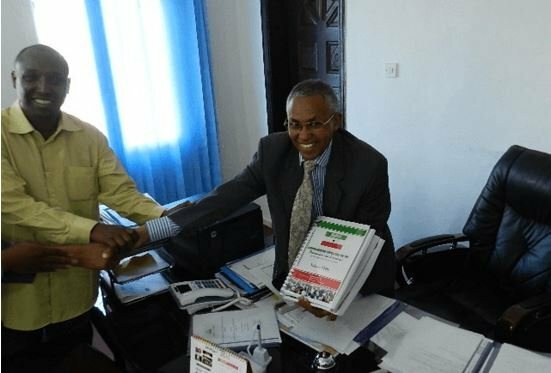 The documents, which have been compiled over the last 25 years, were handed over to the Somaliland Minister of Foreign Affairs and International Cooperation and his deputy in a formal ceremony. The hope is that the information will aid in the understanding of the factors that influence foreign policy and also in the fostering of diplomatic relationships which are and will be vital in the push for recognition and statehood for Somaliland. Somaliland Minister of Foreign Affairs and International Cooperation Dr. Sacad Ali Shire and Deputy FM Hon Ahmed Jama Farah today at the Foreign Affairs Ministry Headquarters received top Somaliland researchers, Mr. Mohamed Abdullahi Dualeh, a political analyst and an independent researcher who specialized in matters regarding International Relations and Mr. Mohamed Ahmed Mahmoud “Barwaani”, a senior civil society member and senior researcher and Rooble Sahardiid, senior journalist presented the Minister of Foreign Affairs with several volumes of comprehensive literature chronicles on Somaliland recognition and Statehood, gathered and compiled over the past 25 years. Mr. Mohammed Abdullahi Dualeh, speaking during the formal handing over ceremony said, “Since the independence of Somaliland in 1991, there have been multi-dimensional challenges against Somaliland foreign policy. The challenges have led to ineffective diplomacy challenges which have made the country remain in isolation for years. The isolation of the state also has implication on the affairs of the government in the country and internationally, hence the need to formulate an effective approach to deal with the outstanding obstacles facing the nation’s recognition request. “The skill and profession of the Somalilanders involved in the process both leaders, scholars and Somaliland diplomats will remain crucial in developing and designing of the Somaliland political strategic papers which will conceptualize the foreign policy and strengthen the approach of integration to Somaliland, to sustain a robust and long-term effective foreign policy. We hope these documents will help the Foreign Affairs Ministry to academically and strategically analyze what went wrong on Somaliland’s quest for international recognition”, Mr. Dualeh noted. Somaliland Minister of Foreign Affairs on his part lauded the efforts of the local researchers in compiling the vital political strategic papers which are very important, especially at a time when Somaliland wants to redesign its foreign policy. Dr. Sacad Ali Shire further stated, “The Ministry of Foreign Affairs and International Cooperation is open to everyone who can participate in the reforming of the country’s political, social and economic subdivision which later will inform the ability to master the diplomatic issues and reduce the challenges of foreign policy that are always factors in cultivating international recognition.